Account settings can be accessed by clicking the Settings button in the app menu. 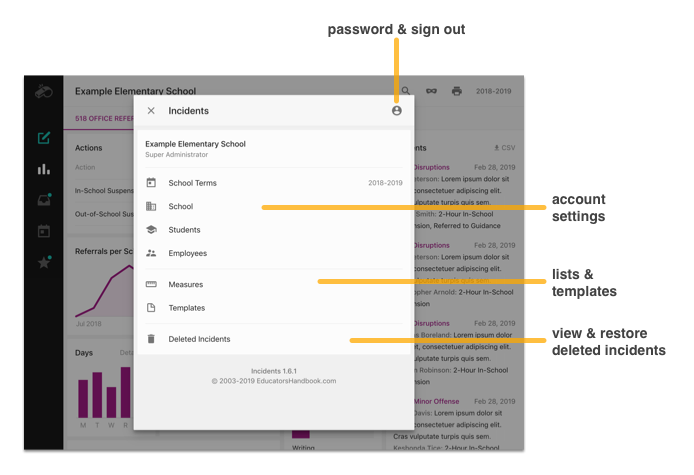 The Settings view lets you access deleted incidents, change your password, and customize the behavior of your EducatorsHandbook.com account. The deleted incidents list provides a convenient way to locate and restore incident data that was deleted from your account. All users have access to this view, which will only show incident data that they can access through their reports. Users with the ability to delete incidents can also restore individual incidents from this list. You should begin each school year by adding a new school term to your account and setting the term as the current term. 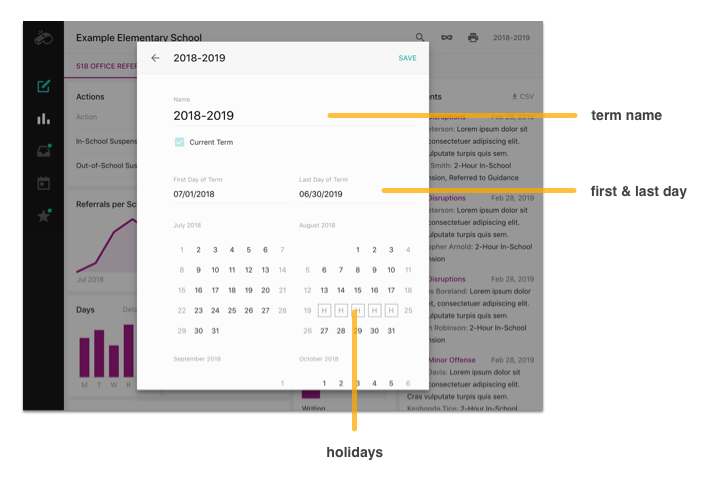 You can add a new school term by clicking the New Term button in the toolbar, entering the first and last day of school, specifying district holidays, and clicking the Add button. Access reporting from different terms by clicking on the terms button in the toolbar of any report. Set your list of schools (district) and edit school information, including: the district code for each school, address, phone number, school day, and action tracking settings. Make sure you always import a complete snapshot of your enrollment (as opposed to just new students or a single grade level). Make sure the column layout matches the instructions at Settings -> Students exactly. We do not support extra columns or out-of-order columns. Make sure you always use the same student number for every import. Some student information systems support multiple student number types. Add, edit, and remove employees from your account. The district code used when reporting incidents or importing your students. Policy (Offenses) The relevant district policy or code-of-conduct that fully defines the offense. This information can be used to populate parent letters and other templates. Administrator Use Only (Offenses, Actions) Restrict use of the item to building and district administrators. For example, you may have several actions that can only be assigned by administrators. Duration Required (Actions) Require that the user specify a duration when assigning the consequence. For example, check the box for out-of-school suspension to ensure that each use of that action is properly documented. Indicates that a student assigned the consequence will miss classroom instruction as a result of the action. This provides you with a measure of the impact your discipline program has on student instructional time. Indicates that the offense type involves a victim. Users will be required to specify victims for any incident for these offenses. A special parent letter for use when a student receives his or her first office referral that includes information about your school’s code-of-conduct or discipline plan. A combination document that includes a parent letter and record of disciplinary action so you can print both documents at the same time. A parent letter that corresponds with a specific type of disciplinary action, such as a suspension letter that includes driving directions to a district suspension facility. A document containing the fields your office staff need for district, state, or province reporting. A document for very serious offenses for reporting incidents to local law enforcement agencies. Change your password at Settings -> Password. Passwords must be between 6 and 20 characters in length and cannot be the same as your username. If you are using the default password, you will be prompted to change your password each time you login. You should choose a password for your account that is not easy to guess. The inclusion of numbers and special characters such as !, @, #, $, %, &, and * will improve the strength of your password and make it more difficult for an unauthorized individual to gain access to your account. Customize your account with the Settings functions. Enter information about your school year to ensure accurate reporting.